Beats Antique "Shadowbox Tour 2017" with Asadi - Otter Productions Inc. | Otter Productions Inc. 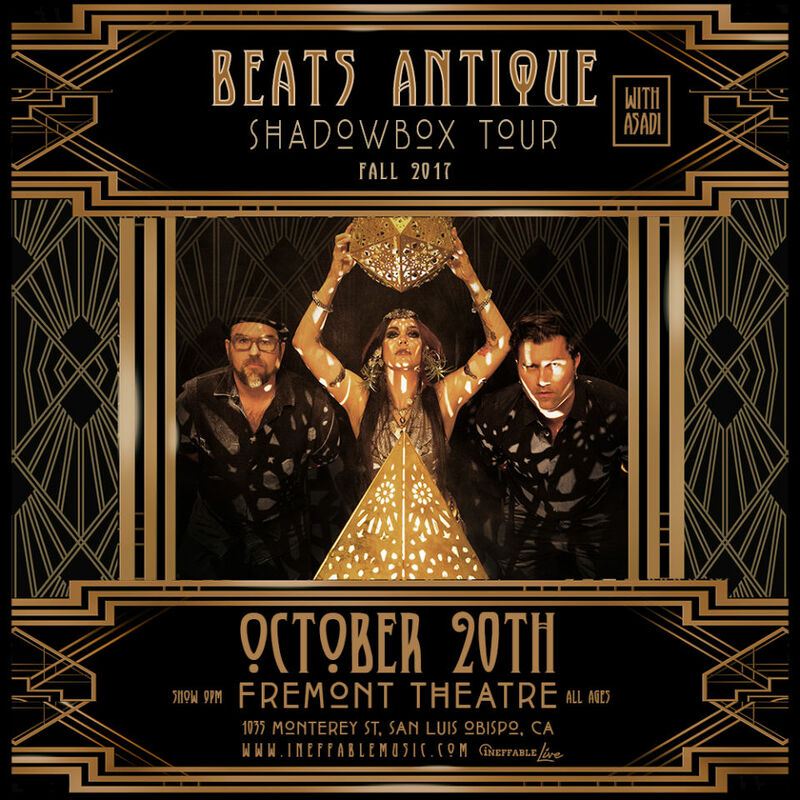 Beats Antique "Shadowbox Tour 2017" with Asadi - Otter Productions Inc. Beats Antique is a U.S.-based experimental world fusion and electronic music group. Formed in 2007 in conjunction with producer Miles Copeland, the group has become noted for their mix of different genres as well as their live shows, which mix samples and heavy percussives with Tribal Fusion dance and performance art. Beats Antique came together to make music for Miles Copeland’s Bellydance Superstars extravaganzas. The trio is composed of David Satori (guitar, saz, viola, and percussion), Sidecar Tommy Cappel (keys, toy piano, drums, and percussion), and Zoë Jakes (belly dancer, composer, and arranger). Their music incorporates Middle Eastern grooves, Balkan wedding music, flamenco, French Gypsy jazz, hip-hop, dub reggae, and other Eastern tonalities, all pulled together with electronica that won’t put off club kids, but will appeal to world music lovers as well. All of the bandmembers have a long history of innovative music-making behind them.